Most of the times that I wear earbuds, I’m at the gym. I started with wired ones, graduating to wireless, with a cord behind my head that attached the earbuds to each other. 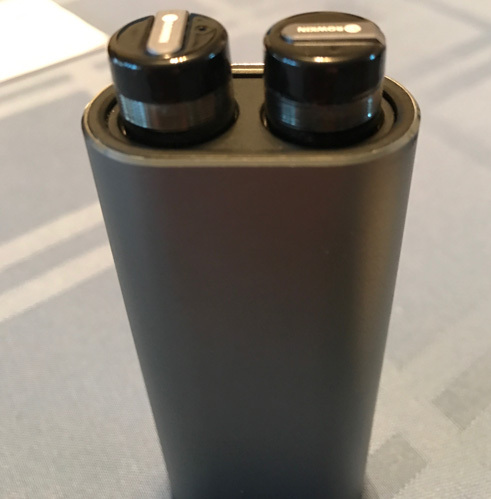 For the last two weeks I’ve been testing the Rowkin Bit Charge Wireless Earbuds, and I’m thrilled to say that they are my new favorite. 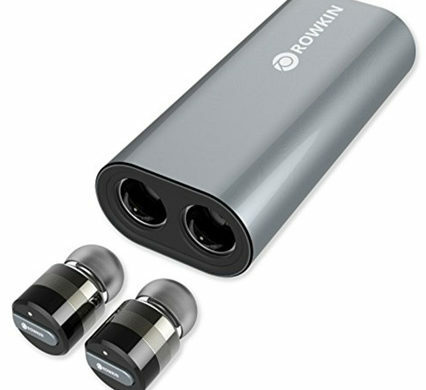 The Rowkin Bit Charge Wireless Earbuds (Bit Charge for short), are small, stereo wireless Bluetooth earbuds. They come in a charging case that doubles as a storage unit for the earbuds. A six inch micro USB charging cable (though I wish it was a bit longer) is included that charges the case which in turn charges the earbuds. The case can also charge other USB devices. A little more work is involved to pair the earbuds to each other and then to your device, but it takes about a minute then it’s done. No need to re-pair unless it’s to another device. An LED indicator on the controls show when the earbuds are paired, and distinguish the primary from the secondary. This is important, as only the primary earbud can be used for phone calls. A blue light on the bottom of the case signifies how much charge is left. Four flashing lights means the case is fully charged. Each light represents 25% charge. I’ve only charged the case once, and that was when it arrived. It currently shows 75% charge. A thin button on each earbud is the control. Either one can be used to turn the Bit Charge on and off, and play or pause music. Phone calls and voice commands are strictly functions of the primary earbud. Volume adjustments or skipping ahead or back must be done on the device. As much as I enjoy music, I’m not an audiophile, as in, I’m not a stickler about mid range, bass, etc. To my ears, all the genres I listened to sounded great, though a little weak in the bass. No cringe worthy noises or artifacts that I could decipher. That said, I also have the EQ off. Listeners with more audio expertise can tweak the EQ to get just the right sound. Examples of tracks on my testing playlist are Uptown Funk by Bruno Mars and Mark Ronson, Stairway to Heaven by Led Zeppelin, More Than A Feeling by Boston, Hollywood Swinging by Kool & the Gang, Low by Flo Rida, and Bad Touch by Bloodhound Gang. 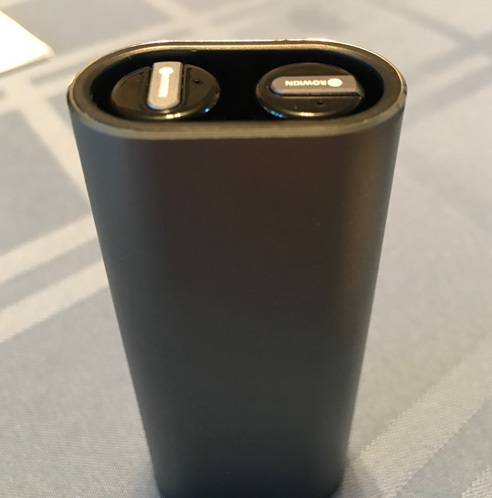 Rowkin claims the Bit Charge will last up to two hours listening to music, and up to three hours talk time. In my testing trying to drain the battery, the earbuds lasted two hours 40 minutes listening to podcasts followed by music. After an hour the battery dropped to 80%. Another hour of music brought the battery to 70%. The third hour plummeted to 50-30-20% very rapidly. A gentle beeping sound in the primary earbud let me know it was time to recharge. Using the Bit Charge for a phone call was flawless. I spoke to one of my kids for 40 minutes with no drops. Sound was clear for both of us. I walked around, staying within 10-15 feet of the iPhone. There was no difference in sound quality. I also put the phone in my back pocket, laid on the floor, jumped up and down; no Bluetooth drop. Overall it was a very positive experience. Most of the time I use the Bit Charge at the gym. I do a little bit of everything while I’m there: walk/run on the treadmill, lay down on the mat to work abs, flip over for planks. The earbuds never fell out, nor did they ever feel like they might. They are comfortable and secure in my ears. Music to my ears (no pun intended) as I’ve had problems in the past keeping earbuds in. The Rowkin Bit Charge Wireless Earbuds are sweat proof, water resistant, and IPX5 waterproof, making them a safe choice for working out or any other athletic activity. 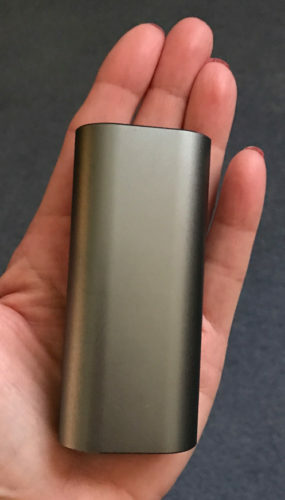 However, I found when using the Bit Charge outside, the connection would drop if my phone was in my pocket, front or back. No issues while holding my phone in my hand. Back in the house, I can keep my phone in my back pocket with no Bluetooth problems. Is it strictly a side effect of being outdoors, or is it a problem with the earbuds? This is a serious issue that needs to be addressed, especially for users who want to use the earbuds while hiking, running, or pursuing other outdoor activities. I love the design of the Bit Charge and its case. The earbuds pop into the magnetic charging port, where they stay until you remove them. Push the bottom of the case up to insert the earbuds, then push down to secure the earbuds in the housing. I carry the case in my overstuffed pocketbook and the earbuds have never fallen out. At just under $130, the Rowkin Bit Charge Wireless Earbuds are not cheap. I wouldn’t use them on plane for two reasons: I’m usually on a plane longer than two hours, which means the battery will drain, and I’d be terrified of dropping the earbuds, never to be seen again. That said, my new earbuds of choice for the gym and puttering around the house are the Rowkin Bit Charge Wireless Earbuds.